Only $20. plus s/h. for US. Go herefor ordering details. Articles on the World Christian Gathering On Indigenous People (WCGIP) or the "First Nations" Movement with leadership such as Richard Twiss, Daniel Kikawa, Terry LeBlanc, John Dawson, Don Richardson and many others. "But I do not endorse movements that, for all their good intentions, are a mixture of good, unbiblical and heretical theology. How can we effectively bring the gospel if that gospel is tainted by the world, the flesh and the devil. We as Christians must stand firm in the faith once for all delivered to the saints. We must not get involved in ecumenical movements that look like the world, act like the world, and instead of bringing the Word to the world are bringing the world to the world." Go here for a commentary on the full transcript of the "Word To The World" radio programs 541-550. Richard Twiss is spreading the doctrines of the New Apostolic Reformation and is endorsed by them. He claims that the Great Spirit of the Indians is the Holy Spirit of the Bible, and endorses ministries who make this same claim. He endorses and promoted books by people like Daniel Kikawa that present information as fact when it is proven myth. He continues to teach that the Great Spirit is the Holy Spirit by wearing the cultural items associated with the Great Spirit, even though it is a historical fact that the Great Spirit is a pantheistic god that required blood rituals and human sacrifice. Richard Twiss claims that what he is doing is not syncretism, when it is the very definition of syncretism. Unbiblical teachings by the organizers and participants of this conference including Richard Twiss, Daniel Kikawa, Aloha Ke Akua and YWAM. Two stories to illustrate and correct the false teachings of "A Call To All Nations" speakers including Don Richardson, John Dawson, Richard Twiss and Daniel Kikawa with regard to there being worship of the true God in hundreds of cultures from the beginning. The accuracy of oral tradition is, in a word, "inaccurate". I dare say that if we were able to trace back most oral traditions today, as God sees them from an eternal perspective, we would see the mutations, changes and fabrications involved in modern mythology. We would also see a lot of "fables". This article is a reminder of what Hawaii was like before the Gospel was preached. This is the account of a very important eyewitness. It is an unfortunate fact that often, by the third generation of Christians in any given area of the world, important information has begun to be lost and forgotten. This is clearly evident in the writings of people like Daniel Kikawa. The stark facts, of Hawaiian culture and religion before the Gospel was preached in Hawaii, are made evident by the testimony of a man without whom the peoples of Hawaii would never have had the opportunity to hear the Gospel message and would still be living in the sins of their ancestors. A series dealing with the issues raised by the First Nations Indigenous People's Movement. When you mythologize religion and ignore the clear teachings of the Bible, as above, in order to make people feel better about themselves and their cultures, you are effectively preaching another gospel. The latest fad is potentially the most grievous heresy to arise in the recent history of the Church. It is a repudiation of literacy -- the written Word. It is now widely being taught to missionaries, particularly through mission groups closely associated with the New Apostolic Reformation (NAR). - A global partnership involving Campus Crusade for Christ, the International Mission Board of the Southern Baptist Convention, Wycliffe International & The Seed Company, Trans World Radio and YWAM�using chronological Bible storying among unreached people groups. Daniel Kikawa, formerly with YWAM and now with his own organization called Aloha Ke Akua, and Danny Lehmann, Director of YWAM Honolulu have repeatedly pulled Romans 1 and Acts 17 from their contexts in order to promote IPM ideology. I have yet to hear them, or any other leader in the IPM for that matter, teach these Scriptures in context. Yanking Scriptures out of context is one of the first marks of false teaching. An expose on the false teachings of YWAM with regard to the Indigenous People's Movement. (1) Golden Calf Evangelism - The gospel of Inclusivism- Daniel Kikawa's very revealing Interview. 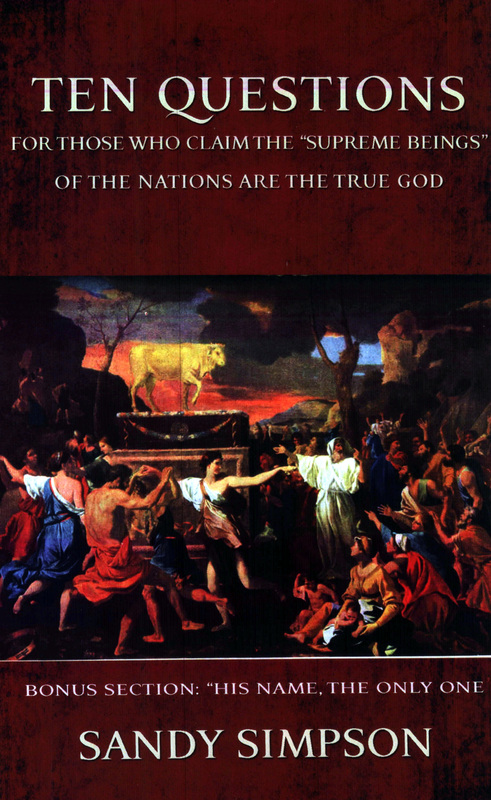 (4) The God�s of the Nations are not God - Are the gods of the nations the God of the Bible? This article is written to expose another false teaching based on a misinterpretation of Scripture, namely the Genesis 11:1-9 account of the tower of Babel. This article is written to clarify the issue of Babel that is taught unbiblically by the First Nations Movement leadership. In this article we will look exclusively at Nimrod and his kingdom, Babel. We will compare what the Bible teaches about him and what it teaches about the coming Antichrist and his short-lived kingdom. The following from the current Wiconi "Smoke Signals" Newsletter is a perfect example of why Christians everywhere need to get the word out for indigenous churches to avoid this Indigenous People's movement. This kind of teaching and demonstration is not a good witness to the world. Danny Lehmann, YWAM Director in Honolulu and pastor at Calvary Chapel Komo Mai was on the Calvary Chapel KLHT radio station again on Friday, June 23, 2006 with another argument to try to shore up the false doctrines that he and others of the IPM, including Don Richardson, Richard Twiss, Daniel Kikawa, have been teaching. Their claim is that God has many names in many cultures and can be legitimately worshipped by those names. Lehmann argues that the proof of this idea comes from the fact that in the Bible God has many "names". The reason for this article is to detail how some of these Bible societies are mistranslating the Bible, using the names of false gods and substituting them for the One True God, the God of Abraham, Isaac and Jacob, the God of Israel, the "I AM", YHWH, Jehovah. In doing this they are following the agenda of the WCGIP Leadership endorsed by Don Richardson and John Dawson of YWAM, and headed by people like Daniel Kikawa of Aloha Ke Akua, Richard Twiss of Wiconi International, Terry LeBlanc of World Vision Canada, and many other indigenous leaders. The purpose of this deliberate dumbing down of biblical truth, changing the names for God, and denegration of His Word has everything to do with social engineering -- purposefully manipulating cultural groups. And it is happening on a global scale. Changing the Bible's name of God to names of foreign gods. Pastor Bosch offered an excellent refutation of this situation in his commentary. "For the truth we cannot rely on the opinions of men but have to trust the Word of God alone. It was Jesus Himself who said: 'I am the way, the truth, and the life. No one comes to the Father except through Me.' (John 14:6). Now which part of that verse is hard to understand or is open to interpretation? The words 'no one' and 'except' are as narrow and exclusive as you can get. Peter said: 'Nor is there salvation in any other, for there is no other name under heaven given among men by which we must be saved' (Acts 4:12). Paul said: �There is� one Mediator between God and men, the Man Christ Jesus� (1Tim 2:5). Hebrews asks how we will escape (since there is no escape), if we neglect the salvation that came through Jesus Christ (Heb 2:4). Over and over the Bible clearly teaches that there is no other way to be saved except through faith in the finished work of the Cross. Jesus said that those who try to enter by some other way are thieves and robbers (John 10:8). To say that there are other ways of salvation is basically saying that Jesus wasted His time to come in the flesh and to suffer and die! If God can save others through some other means then there was no need for Christ to die. Don�t you think if there was some other way, God would have used it? Did Jesus not ask this very question at the eleventh hour? But there was no other way. Jesus Had to die in our place and take our sin so that His righteousness can be reckoned to us. To say that people can be saved apart from the work of the Cross, is surely the greatest blasphemy against the precious Blood of Jesus Christ!�"Don�t let the world deceive you into believing that it is unloving to tell people that Jesus is the only way. It is not loving to tell someone that they are just fine and that they will be saved even though they are on their way to eternal damnation. If we really love people, we will speak the truth to them. But, we have to do that in a loving and compassionate way. Unfortunately many of us adopt the attitude of 'I�m right and you�re wrong � so there.' No, by God�s grace we have been saved and we need to show the same love, compassion and mercy on those who do not know the Way as the Lord showed us. But we cannot be so afraid of offending people that we never tell them the truth. "There is only one way to God and we must preach that message with all our might. Let�s love those of other religions enough to tell them that Jesus and Jesus alone saves." 5) invoke the ideal of global "peace,"
8) use the Scriptures as a way to shore up the purpose or the process. The best way in which to advance the Kingdom of God on earth is by adopting a new gospel of inclusivism. This idea first took root many decades ago. It is now producing abundant variegated fruit. This series of Herescope posts on Pseudo-Mission began with C. Peter Wagner's quotations (7/31/06) about the new nature of international mission work. He had referenced an earlier 1932 Laymen's Inquiry which issued a summary (book) entitled Re-Thinking Missions. Continuing on the topic of inclusivism from yesterday's post, the very next section of Re-Thinking Missions is subtitled "What These Developments Call For." Once mission work accepts inclusivism, then what is next? The answer to this was meditation! I urge anyone reading this article to also read the other articles in the WCGIP section of the DITC web site. It will help you understand the width and breadth of false teaching in this movement. This article contains quotes from the last two WCGIP events. What is amazing to me is that the word "Gospel" and "evangelism" (or "evangelization ... two different terms) are being used freely by the leadership and participants of this movement when it is clear they have little or no understanding of those terms from a biblical standpoint. You cannot claim you are reaching people with the Gospel while, at the same time, teaching that God has been redeeming the Gentile pagan nations (such as we all were) through the stars, their cultures and their religions long before the Gospel ever was preached. That is a clear denial of the biblical statements that Gentiles did not know God. Gentiles did not have salvation, they were not worshipping God, nor did they have hope before they heard the message of the Gospel of Jesus Christ, no matter what Terry LeBlanc, Richard Twiss, Daniel Kikawa and his friends claim. The plans of Ed Silvoso, indigenous people movement and other cultural change agents. In other words, the new heresies teach that man can come to Christ without the Gospel of Salvation but by some other avenue inherent in their culture and religion. And they don't need Jesus to be saved, but can call upon their own local deity. And once they get "saved," they can "redeem" the pagan religious practices in their culture and make it part of their new faith. They never need to separate from their old ways. In fact, they are encouraged to bring back the old pagan ways! The above quotation is an example of the most horrifying new heresy to come out of the "redeeming cultures" movement. This particular heresy is a major theme of the new book Idolatry In Their Hearts by missionaries Sandy Simpson and Mike Oppenheimer. It illustrates the extent to which Scripture and history are being re-written to accommodate a new body of doctrine for a new global church age. In this particular case there is a multi-pronged attack going on against the biblical names for God which not only substantially erodes the Scriptural foundation, but actually replaces brick and mortar with pagan idols! Very little has been written to counter the plethora of false doctrines surrounding "Identificational Repentance," "Reconciliation," and the accompanying practices. Tragically, many esteemed Christian leaders from all walks of Christianity, have been pulled into the Reconciliation Movement and/or "Identificational Repentance" because it sounded like a good thing to do. And most of these activities have a "feel good" component that makes them seem right. But the plain error of these activities can easily be found in Scriptures and refuted quite simply. We deal with these old heresies brought forward to modernity, these ideas that all men have have a relationship with God that will cause them to be able to avoid judgement in our book on the teachings of the World Gathering on Indigenous People movement called �Idolatry In Their Hearts�. The idea that all men who worship a �god� are worshipping the true God, YHWH, has bubbled up to the very top of our societies and religions, and even Christendoom, and should sound a warning alarm to true Biblical Christianity. Instead, as usual in our day, most Christians are asleep at the wheel while Universalists claim that you can pray to a �god� like Allah and be praying to the true Trinue God, YHWH. I also dealt with the fact that Allah is not YHWH, both in our book and in the article �Is Allah The Same As YHWH?�. Yet just recently George Bush, a professing Christian, who has obviously been led astray by false teachers and his heretical counselors like T.D. Jakes and Ted Haggard, came out with these statements in an interview. In summary, ArabBible uses the definite, common noun, �al-ilaah� to refer to God, rather than the Islamic proper noun, �Allah�. We believe this is based on good Biblical and linguistic precedents. Throughout the Bible we find Jesus asking those he called to follow him and no one else. So how should we respond when we see Christianity joining hands with paganism? Obviously the very term Christian-paganism is an oxymoron. However, there are a number of indicators which show this trend is underway. Emerging spirituality is changing the way missions is being conducted. The idea is that you can go for Jesus, but you don�t have to identify yourself as a Christian or part of the Christian church. This concept spills over into some missionary societies too, where they teach people from other religions they can keep their religion, just add Jesus to the equation. They don�t have to embrace the term Christian. First let me preface this article by stating that Satan knows the Bible and counterfeits the true religion God gave to man to bring confusion. He did this before and after the events take place as well. Horus, Mithra are often used by atheists and those who side with Pagan religions- but these are myths and the Bible has been substantiated with the manuscript evidence -archeology, and PROPHECY. The Worship of another god as God. While reaching today�s generation for the cause of Christ is something we as Christians should all desire, we must remember Jesus Christ challenged us to follow Him and be obedient to His Word. Scripture commands us to �be not conformed to this world: but be ye transformed by the renewing of your mind� (Romans 12:2). But the emergents are leading followers in the opposite direction, teaching that the Word of God needs to be conformed to people and cultures instead of allowing it to conform lives through Jesus Christ. Reimagining Christianity allows a dangerous kind of freedom; like cutting the suspension ropes on a hot air balloon, the free fall may be exhilarating but the results catastrophic. Unfortunately, few Africans [she knew in Zimbabwe] are truly Christians. The problem stems from the fact that there is just too much of this "cultural" (read demon worship) approach to almost all aspects of life even amongst said Christians. A controversy is brewing over three reputable Christian organizations, which are based in North America, whose efforts have ousted the words "Father" and "Son" from new Bibles. Wycliffe Bible Translators, Summer Institute of Linguistics (SIL) and Frontiers are under fire for "producing Bibles that remove "Father," "Son" and "Son of God" because these terms are offensive to Muslims." In fairness to SIL/Wycliffe, here is that response to the above article by SIL. However, their explanation does not explain why certain Father/Son passages are being targeted in Arabic Bibles. This edition of Crosstalk looks at the newest trend in Bible translations. This latest effort involves altered Bibles that remove and/or modify Bible terms such as �Father� in relation to God and �Son� as it pertains to Jesus or the Son of God in order to refrain from being offensive to Muslims. The publishers involved in this controversy are Wycliffe Bible Translators, Summer Institute of Linguistics and Frontiers. Last week Biblical Missiology circulated a petititon, which begins: Western missions agencies Wycliffe, Frontiers and SIL are producing Bibles that remove Father, Son and Son of God because these terms are offensive to Muslims. Hussein Hajji Wario is a former Sunni Muslim who was educated in Islamic religious school. Upon graduation he became a Madrassa teaching assistant and a Muadhin who called Muslims to pray. He converted to Christianity in 1989. He comes from the Orma people group which is 99.98% Muslim. He is only the second Orma to convert to Christianity. He was persecuted on account of his faith and came to the United Stated in 1996. He has published his autobiography, �Cracks in the Crescent�. As reported on a recent Crosstalk, a controversy has come to light over the last several months on whether or not Wycliffe Bible Translators, the Summer Institute of Linguistics (SIL) and Frontiers has produced a translation of the Bible that panders to Muslims. As a former Sunni Muslim, Hussein Hajji Wario has been following the Wycliffe issue for quite some time. Join Vic as he allows Hussein to explain how he became involved in this controversy, the areas of Scripture that are affected, how Wycliffe Bible Translators and Frontiers have been responding to the controversy and more. Bible translation is not typically considered newsworthy, but the current controversy over Wycliffe's translations has just made international news. An article picked up by the Washington Post and over 150 other news outlets reports that "US Bible translator agrees to review after criticism over substitutions for 'Son' and 'Father.'" Indeed, Wycliffe and SIL agreed to, and in fact sought out, a review by the World Evangelical Alliance (WEA), with a recommendation on their translation practices due by the end of the year. Given that these controversial translations are currently available and thus creating inaccurate understandings of God, Biblical Missiology appeals to Wycliffe and SIL to immediately withdraw them. Frontiers has placed the national church in a difficult and awkward position through its continued defense of this translation, in which "Father" is rendered "protector/helper," and Son is rendered "God's representative," and in which baptism is described in terms of Islamic ritual ablutions. Nanci is a First Nations Canadian Cree woman who is the daughter and granddaughter of medicine men. Growing up, her life was filled with the practices and mystical experiences brought on from Native Spirituality. Today, as a born-again Christian, Nanci warns of these dangers as she sees many of her Native American Christian brothers and sisters incorporating Native Spirituality into their spiritual lives and also sees many non-Native Christians incorporating Native Spirituality into their own lives. A deep love for both Native Americans and non-Natives is what motivated Nanci to write Muddy Waters. It is also what has motivated Lighthouse Trails to publish the book. We would never want to give the impression that we or Nanci have any animosity toward Native Americans. On the contrary, we are very aware and deeply grieved about the injustices and cruel and prejudiced treatment that Native Americans have received in the past and sometimes still do. (52) Updated! Perpetuating Nations Myths by Mike Oppenheimer, Let Us Reason, video preview, 6/5/12 - - See Preview 1, Preview 2 & Preview 3. The first thing I thought of when reading the reasons for this vile approach to Scripture is, �If they think they cannot use the familial terms for Father and Son, at the least haven�t they heard of footnotes?� I was pleased to find that this is what Biblical Missiology appeals to for any possibility of misunderstanding. Yet why be afraid of misunderstanding in the first place? Is not the Gospel supposed to be an offense to those who refuse truth? Have these people become so enamored of their political and social agendas that they have forgotten that Jesus is a stumbling stone and a rock of offense? Would it not be better to risk some misunderstanding in order to be true to God�s Word? Or have these people forgotten that understanding comes through the Holy Spirit? God is certainly capable of imparting understanding to the pure heart seeking truth. All others will find fault no matter how far translators may go in attempting to placate them. Better to die for the truth than to make points with a lie. We at Lighthouse Trails, as do other ministries like ours, have a sense of urgency to call all Christians to return to their true roots � namely the Gospel. Our loyalty needs to be with our Savior and not with the traditions of men. Whether we are Native American or of European or any other descent, Jesus Christ needs to be more precious than any of the things that would make us appear politically correct or gain the favor of men. Dream catchers�those spidery �sacred hoops� with feathers. They originated with the Ojibwa tribe during the �60s and �70s, supposedly to protect a sleeper by �catching� bad dreams or evil spirits. Then they caught on with other tribes and spread through the New Age movement into popular culture. Today, it is not uncommon to see dream catchers in gift and variety stores. Does Christianity and Islam share the same God, the same teachings of God? If so then the names of God from each religion would be interchangeable. One issue that continues to come up is the name Allah as an appropriate generic name for God. Some believe this name is acceptable to use inside the church. While those practicing Native Spirituality may believe they are practicing a completely unique form of spirituality, originating with them, they couldn�t be further from the truth. Native Spirituality is just one part of a vast movement that is creating a paradigm shift in our present-day culture away from biblical Christianity and replacing it with an all-inclusive interspiritual global religion that relies heavily upon mystical practices. The results will create a �Christianity� that has no resemblance to biblical Christianity whatsoever. Frankly, we're disappointed. Your "participation" was signing an online petition asking Frontiers to keep "Father" and "Son" in their Bible translations--and now you're being invited to support them. Some of you told us you were offended; others were confused. We agree. While you can use the "unsubscribe" link at the bottom of Frontiers' email, today we asked Frontiers to stop sending support emails to people who didn't ask to be on their distribution list--people who have even expressed deep concerns about the work of Frontiers. What was notably missing in Frontiers' report was any reference to their commitment to continue defending Bible translations that remove, revise or obscure the Scriptural terms for "Father," "Son" or "Son of God." For example, Frontiers produced the True Meaning of the Gospel of Christ in Arabic, which always removes "Father" in reference to God, and redefines or removes "Son." The Great Commission in Matthew 28:19 reads, "Cleanse them by water in the name of God, his Messiah, and his Holy Spirit," tragically avoiding the biblical and trinitarian wording of ". . . in the name of the Father, the Son, and the Holy Spirit." The True Meaning is still for sale on Amazon (UK) and the Al Kalima website. 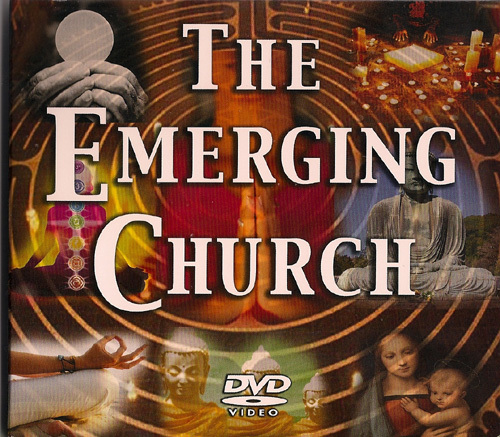 The emerging church is a movement that is said to be a new way to do Christianity, a way that is supposed to reach out to the postmodern generation in a more relevant way than traditional Christianity. In reality, the emerging church, which is really a merging church, is a full-scale ecumenical effort to unite all religions against biblical Christianity by using mystical practices to accomplish this. In the emerging church, doctrine becomes unimportant while unity at all costs becomes the most important thing. But in spite of these �normal� childhood experiences, an underlying current of a mystical spirituality permeated our young lives. In fact, it affected nearly every aspect of our lives. According to some Native Spiritual practitioners that I know personally, including people from other religions, we worship the same God regardless of what name we use to call God. In 2011, an emergent church group held A Symposium on Progressive Christianity. Progressive Christianity is another way of saying non-biblical Christianity. Question: Why are Christians so adamantly opposed to the many other concepts of God that are honored in other religions? I agree with what Vice President Al Gore said at the 1993 Presidential Prayer Breakfast in Washington D.C.: �Faith in God, reliance upon a Higher Power, by whatever name, is in my view essential.� Think of the unity there could be if religions would stop quarreling and honor all concepts of God in an open-minded and brotherly fashion! Response [Excerpts]: Yes, think of the unity there could be if we would all agree that two plus two equals five�but that wouldn�t make it so. A �Higher Power�? How high? Higher than what? And what does this mean? A year ago we introduced the petition to keep organizations faithful to translate the Bible, and in particular the terms "Son" and "Father" as they relate to the Triune nature of our God. A lot of time has passed, and much has been done, but we still need your help to build awareness about this travesty against the familial relationship of the Son and Father. This year we have a lot more exciting things planned and we will keep you informed because we know you will not stand for these translations. Here is an update of what has been happening: As you know, missions agencies such as Wycliffe, Frontiers and SIL have been producing Bible translations that remove or replace "Father," "Son," or "Son of God" from the text, using instead terms such as "Guardian" or "Representative." Despite the objections of Christians all over the world, this practice continues: just a few months ago, Global Partners for Development (mentioned in our Fact Sheet) produced 10,000 copies of a new translation for Bangladesh, that uses "intimate chosen beloved One" instead of "Son," and "guardian" instead of "Father." Lost in translation, sadly, is the eternal, familial, loving relationship of God the Father and God the Son, and the invitation into that relationship established by the life, death and resurrection of Jesus, the Son of God. Christian catechism and biblical worldview are related to Islamic theology though largely in a negative way. The theoretical categories such as God, man, sin, and salvation appear to be similar to those of Islam but the content is vastly different. Not only is the content different but also the worldview concepts that lie behind the content are understandably different. Because of this, it is possible for a Christian and a Muslim to discuss the nature of God without ever agreeing on any point even though they assume they are discussing the same God. In today�s world, there are Christian missionaries who are trying to blend biblical teaching with the theology of Islam without understanding that each aspect of doctrine carries different meaning for the two groups. When doctrine and practice differ, a fusing of the two is syncretism. See other parts: Part One: The Historical Development of the Arabic Bible Part Two: My Personal Journey in Bible Translation Part Three: Translation Philosophy Part Four: The Need for a Paradigm Shift in Bible Translation Introduction This paper is based on almost forty years of involvement in Bible translation in various Middle Eastern languages. D. A. Carson�s survey of the term Son of God comprises three chapters of sound thinking and engaging prose. You will be tempted to skip chapters one and two in order to head right to chapter three (his evaluations). Do not give in to the temptation. 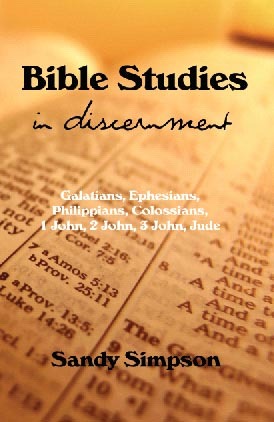 It is well worth your time�it does not take much time to read a book that is slightly more than 100 pages in length�to work through the broad understanding of the Christological title (chapter one) and the exegesis of Hebrews 1 and John 5:16�30 (chapter two). Both chapters plow some important ground for the harvest of chapter three. A growing trend in the evangelical church is what is referred to as �redeeming the cultures� or �Cultural Identification.� Essentially, it is the idea that God created cultures and has no desire for anyone to leave their cultural practices but can incorporate their belief in Jesus into their already existing culture. Thus, we see this moment as a critical time for Wycliffe/SIL. It is our sincerest hope they will produce faithful and accurate translations of God's Word and thus regain the trust of the global Church. In conclusion, this puts the matter to rest about the claims that the religions of the world have always been monotheistic the further back in time you go. Hogwash! People who make these claims need to learn from anthropology, archeology and especially from the Bible! There are many people who have tried to prove this concept and it seems to always become a trend within the church. The Bible strictly forbids looking to the stars for knowledge, learning or answers (Deuteronomy 4:19; Isaiah 47:13). On this alone one should not entertain this concept. We can't know the exact reason why God did not speak to the Gentiles the way he spoke to the Jews because God does not tell us. However, that does not mean we can't offer some possibilities based on what we see in Scripture. God and Satan are not two equal powers in a dualistic battle between good and evil. God�s power is infinite whereas Satan can only do what the Lord gives him permission to do, as evidenced in the Book of Job. Therefore, Satan�s power is limited whereas God�s power is without limit. Our Lord reigns as the supreme Creator and King of the universe, and His purposes are being accomplished in the world whether or not His creatures accept Him as Lord. The following information illustrates the relationship between God and His creation. No, Christians and Muslims do not worship the same God. There are similarities in their views of God, but there are also distinct differences. This is the caution, we need to be very careful in using new evangelistic methods so that we do not have any syncretism of Islam with portions of Christianity, as in Chrislam. There is no example in the Bible of anyone �saved� by general revelation. No one looked up at the stars or studied nature and was saved. The Bible says we are all saved the same way, by Christ's sacrifice. Jesus gave His own life according to the Fathers will to save the lost, faith in what He did must be exercised or it is only understood as a historical event. Comment by Mike Oppenheimer: This is unbelievable to me, do they not know their Bible. They are calling on a different god than the God of the Bible, the Father of the Lord Jesus Christ, who is the Son of God. There is Son or Father God in Islam. If they are faced with terrorism do the call on Allah? You can thank the Catholics for this kind of merging of names. As if the Hebrew name or even Greek name that the bible was written in is not adequate to use. Catholics have always brought portions over of other religions to merge with their Catholicism but this should be evident what not to do. Calling YHWH, the God of Israel Allah cannot be acceptable to Biblical practicing believers nor to God himself. Its time to make a change and correct this compromise. For God is not lenient in calling upon him with other gods names. Certainly a solution can be found to call im Father as the New Testament teaches and even uses the Aramaic for this. Nowhere will you find an apostle using a particular gods name, they purposely use the generic Greek term, theos for the Gentiles they were witnessing to. An example of reaching the gentiles in Acts 17. He showed the philosophers they were wrong from logic, their own history and the Bible and explained to them what is right. He was brought to Mars Hill where the finest philosophers and seekers congregated. He used what the Athenians did not know, an altar to an unknown god to make known to them what he knew (Acts 17). V.23 �the One whom you worship without knowing, Him I proclaim to you.� Paul was not complimenting their religious worship as they were idolaters. In v.30 Paul did not mock them but gave it to them straight "Truly, these times of ignorance God overlooked, but now commands all men everywhere to repent.� These religious men of prestige were offended as he told them they would be judged by a man who came back to life (Acts 17:31-33). So, since the only way for us to be forgiven is by the work of God and Jesus is God in flesh, then the only way to be saved is through the single person of Jesus. That is why Jesus said in John 14:6, "I am the way, and the truth, and the life; no one comes to the Father but through Me." Also, It says in Acts 4:12, "And there is salvation in no one else; for there is no other name under heaven that has been given among men by which we must be saved." There is no other way to be saved because "...if righteousness comes through the Law, then Christ died needlessly," (Galatians 2:21). And, "...if a law had been given which was able to impart life, then righteousness would indeed have been based on law," (Galatians 3:21). While Batterson doesn�t talk about Native Spirituality in his book, I feel it is worth mentioning his book and his �circle making� because this is a way that conditions Christians to more readily accept Native Spirituality, whether Batterson intended it or not. Everything in Native Spirituality is done in circles because the power of the world works in circles, so everything is deemed circular from childhood to worship. As the moon, sun, and earth are all round, so it is that all circles attract a spiritual energy as does symbolic expression. The circle that the medicine wheel represents is an integration of energy and matter, as well as spirit and man, so as to achieve a greater spiritual understanding and creation. Some segments of Native Spirituality involving circles are: round dances, talking circles, pipe ceremonies, drums, four quadrants (north, south, east and west), seasons, and life of man. The teachings of the New Apostolic, Emergent Church and World Christian Gathering of Indigenous People are promoting both Inclusivism and a new, radical, Replacement Theology. It is therefore imperative that true believers get away from these false teachers who are teaching utter heresy and stand up for the truths of God�s Word before all mission work is lost. Indeed, it was the conviction of Dr. Bernard Northrup, a translator of both Hebrew and Greek Scriptures, that the Jobab of Genesis 10:29 was exactly the same person as the one featured in the Book of Job. � They have taken the Jobab of Genesis 36:33-34, from the line of Esau, and made him the Jobab of the book of Job. In doing that, they have acknowledged that the name Jobab and Job are the same name in related languages. However they have chosen the wrong Jobab! They should have chosen the one from Genesis 10:29. You then ask why? The reason is that, at the time of Jacob and Esau, the maximum age that was attained according to Scripture was 147 for Jacob and 175 for Abraham. These numbers are concordant. But the Alexandrian LXX tells us Job died aged 248 years or about 100 years longer than the Scriptural norm for the time of Esau. In fact we have to go back to the days of Peleg before we find people living about 250 years as a typical lifespan. Therefore, the choice of Jobab between the descendant of Esau or the nephew of Peleg is made plain by the mathematical consideration of their ages. I need to provide some background to this article. I first heard Samy at our Calvary Chapel church in Pearl Harbor. I was shocked to hear how he is �evangelizing� Muslims. I subsequently found out that his book was endorsed twice by Chuck Smith and that he was stating, although played down at that time of 11/07, that he prayed to Allah. I then sent the following email exchange I had with Samy to Chuck Smith and later someone handed a physical copy of it to Bill Stonebraker of CC Komo Mai. Not only did I not receive a response from Chuck Smith or anyone in his office (too late now) I was also shocked to hear that Samy has now been invited to speak at Calvary Chapel Komo Mai while Stonebraker is in Israel conducting a tour. So all of this has fallen on deaf ears. After you read what Samy said I think you will understand the seriousness of this issue, especially since both Smith and Stonebraker have declared many times that Allah is not God. Why then do they continue to allow Samy access to their churches if they still believe that Allah is not God? In my article �Blasphemizing the Bible� I give a number of examples of how a lot of modern Bible translation societies are putting the names of �supreme beings� in the Bible in the place of God or YHWH. In this article I'm going to examine two of the excuses they make for making those substitutions in the Bible in many hundreds of different languages today. (1) They claim that God has many different names and therefore they think they are justified in putting the names of various gods of various cultures in Bibles, as long as they are considered �supreme beings�. (2) The second excuse they give is that the names of the �gods� they are placing in the Bible are generic terms for God, like the words �God�, �Theos�, �Dios� and �Elohim�. By generic I mean a word that can be used for any deity whether of the one true God or other false gods who claim to be God. A message on Colossians 2:8-23 that juxtaposes the traditions of men with the knowledge of Christ, the fullness of God. Would it not be better to risk some misunderstanding in order to be true to God�s Word? Or have these people forgotten that understanding comes through the Holy Spirit? God is certainly capable of imparting understanding to the pure heart seeking truth. All others will find fault no matter how far translators may go in attempting to placate them. Better to die for the truth than to make points with a lie. Next month, on July 28-31, Mennonite Church Canada will be gathering together at Native Assembly 2014 in Winnipeg, Manitoba. Together, Mennonites and aboriginals are going to celebrate through song and ceremony on the land, hear from elders and teachers, and bend their ears to the earth. Here they will discover old and new teachings which will bring them �closer to the Spirit, to each other, and to the land.� According to the schedule, each of the four days opens with sacred fire prayer times followed by workshops that teach such things as Water, Fire, Wind and Earth: Creator�s Medicine Chest, following the Natural Laws of Nature, and the 7 Sacred Teachings of the Ojibwe to see what the animals have to teach them. Another workshop is about reading the Bible outdoors in God�s �second book�, the land, to see what happens when one is read in the presence of the other. I find it rather interesting how God has orchestrated things in life, which demonstrate His great love and ongoing mercy to ordinary people like myself. But, more specifically, I am thinking right now about how years ago I happened to come across a copy of a nearly forgotten book at the university library while working on a project. I still find it amazing that this secular humanistic library even had a copy of Stories from Indian Wigwams and Northern Campfires � a book written by a missionary to the Canadian Native peoples of the 1800s sharing not only his life among them but the amazing stories they would tell him as they would warm themselves before a fire. This book is a treasure of the long-forgotten heritage of the Cree and Saulteaux tribes and how their lives were wonderfully transformed through the proclamation of the Gospel. John 8:44 You belong to your father, the devil, and you want to carry out your father�s desires. He was a murderer from the beginning, not holding to the truth, for there is no truth in him. When he lies, he speaks his native language, for he is a liar and the father of lies. Revelation 21:8 But the cowardly, the unbelieving, the vile, the murderers, the sexually immoral, those who practice magic arts, the idolaters and all liars�they will be consigned to the fiery lake of burning sulfur. This is the second death.� Revelation 22:15 Outside are the dogs, those who practice magic arts, the sexually immoral, the murderers, the idolaters and everyone who loves and practices falsehood. Zechariah 14:9 "The LORD will be king over the whole earth. On that day there will be one LORD, and his name the only name." What are the implications of this prophecy in Zechariah? (1) That before the return of Christ there have always been many �gods� worshipped in many names. (2) That the saints who return with Christ (Zechariah 14:5), those who were Raptured, are the ones who had already believed in the name of the Lord Jesus Christ. Those remaining are forced to acknowledge that there is �no other name under heaven given to mankind by which we must be saved� because they were left behind in the Rapture and survived the Tribulation. In this second part of our Dave and Tom classic radio program, they continue their fascinating discussion on the subject of Islam vs. the Bible, Allah vs. the true God, taking an honest look at the subject from many angles. Shahram Hadian was born in Iran to a Muslim family. When he was 7 years old, his family came to America to escape an oppressive Islamic regime. He eventually experienced a transformational life change when he committed his life to Jesus Christ. This not only changed his destiny for eternity, it also changed his situation with his family and Islamic culture as he immediately began to face persecution and disapproval from his family and from the Islamic community. He is now considered to be an apostate and according to the dictates of the Qur�an, deserves to be killed with no repercussions to those who might do so. Shahram is now dedicated to reaching out and speaking out to let people know about the deception of Islam, its true goal that many are not aware of and the threat of Shariah which is the heart of Islam. He spoke about these things at the VCY America rally that took place in September. In the first of this two-part series dealing with Islam and how it's affecting Christianity, Shahram began by noting there is no political correctness in the Bible, so as churches preach truth and love, they need to define terms such as tolerance and love. This involves discussing the truth about whether or not Christians and Muslims worship the same God. This brings up a number of questions that Shahram's presentation tackles: --Is the God of the Bible the same as the Allah of Islam? --Can you be both a Christian and a Muslim at the same time? --Should Christians be reaching out to Muslims seeking spiritual reconciliation? --Should Christians and Muslims be holding joint services? --Are the Bible and the Qur�an equal? --Should we merge both religions into one called �Chrislam�? According to Shahram, Islam denies that Jesus is God, that he's the Son of God and that he's come in the flesh. This is the message of an antichrist spirit. Spreading this message is not only what Islam does, it's what Islam was born to do and if anyone says anything different, they are either ignorant of the ideology of Islam or they're lying. Shahram also refutes the following points that are foundational to �Chrislam.� --There's a common word among Christians and Muslims. --Muslims have a common love of God and neighbor with Christians. There will come a day when Christians who have joined up with New Age practices will have to make a decision to return to Christ and have an undivided loyalty to Him and to His Gospel or to continue on in their occultic, mystical practices. Some have already crossed over the line perhaps never to return to the precious hope we have in the Gospel. God has been so merciful, but His mercy will not be extended forever. Isn�t it better to cling close to the Gospel now and to be ready for the Bridegroom when he returns at an unexpected hour? Ten Questions for Those Who Claim the �Supreme Beings� of the Nations are the True God by Sandy Simpson is our newest Lighthouse Trails Print Booklet Tract. 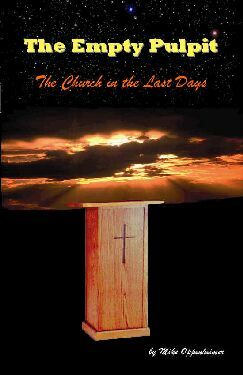 The Booklet Tract is 16 pages long and sells for $1.95 for single copies. Quantity discounts are as much as 50% off retail. Our Booklet Tracts are designed to give away to others or for your own personal use. Below is the content of the booklet. 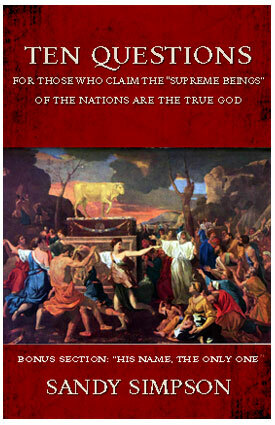 To order copies of Ten Questions for Those Who Claim the �Supreme Beings� of the Nations are the True God, click here. This booklet deals with the �new� missiology that presents itself as legitimate biblical missions when it is not that. God and Satan are not two equal powers in a dualistic battle between good and evil. God�s power is infinite whereas Satan can only do what the Lord gives him permission to do, as evidenced in the Book of Job. Therefore, Satan�s power is limited whereas God�s power is without limit. Our Lord reigns as the supreme Creator and King of the universe, and His purposes are being accomplished in the world whether or not His creatures accept Him as Lord. There are many people who have tried to prove this concept and it seems to always become a trend within the church. The Bible strictly forbids looking to the stars for knowledge, learning or answers (Deuteronomy 4:19; Isaiah 47:13). On this alone one should not entertain this concept. Some misuse Romans 1:20 which is referring to God�s eternal power and divine nature that are clearly seen, not the gospel. Rom.16:25-26: �Now to Him who is able to establish you according to my gospel and the preaching of Jesus Christ, according to the revelation of the mystery kept secret since the world began but now has been made manifest, and by the prophetic Scriptures has been made known to all nations, according to the commandment of the everlasting God, for obedience to the faith --According to my Gospel.� �Which was kept secret since the world began� Col. 1:24-27: ��I became a minister according to the stewardship from God which was given to me for you, to fulfill the word of God, the mystery which has been hidden from ages and from generations, but now has been revealed to His saints.� Its is a Mystery hidden from ages Eph. 3:2-5: �by revelation He made known to me the mystery (as I have briefly written already, by which, when you read, you may understand my knowledge in the mystery of Christ), which in other ages was not made known to the sons of men, as it has now been revealed by the Spirit to His holy apostles and prophets.� The gospel and the application connected to it was hidden, until Christ died and rose again and commissioned the apostles to preach it. The idea of hidden knowledge in the stars (astrology) not found in the Bible sets a dangerous precedent. Can one truly find the gospel by just looking at the stars? Was it made known to all people who can look up in the sky, then why can no one know the story in the stars without knowing the story first (from the Bible)? To say the gospel is in the stars is to claim the reading of the stars can save someone and teach them what Scripture alone teaches. I remember in 1994 when reading this book �Perpetuated in Righteousness� by Daniel Kikawa, I would meet a person that would become a life long friend of mine to this day. This person is Mike Oppenheimer. He broke down the problems in Kikawa�s book for me person to person. I can roughly summarize, but for all the information, see Mike Oppenheimers original work on this teaching found here Perpetuated in Righteousness or Perpetuating a Modern Myth. For those who think that shamanism is a far cry from the contemplative mysticism being practiced in the church today and that this warning has nothing to do with Christians, think again. The realms reached are the same, and the results can be the same too. When Paul spoke the Gospel to these religious pagans in Athens on Mars Hill for the first time, he didn’t wait to become friends first to “share his beliefs.�? This is an absurd method to abide by. He took the time to explain their idolatry and the truth. No one knows how many chances he or she will get to speak to an unbeliever, so you speak as if it is your only time. You cannot be called an evangelist if your purpose is not to first bring the Gospel but instead to be friends and then give the Gospel. This is not how the apostles conducted their evangelism, nor how they taught the church to. This does not mean we ignore developing friendships, but to grow in a relationship takes time and time is not something that we all have. Friendships are not a necessity to speak the Gospel message. It wasn’t to Peter in Acts 2, and it was not to Paul on his missionary journeys. There are those today who use Acts 17, Paul’s Mars Hill encounter with the Greek philosophers, to prove that truth is found elsewhere (or everywhere), and the Bible is not the only place that contains spiritual truth. In February, Wycliffe Bible Translators, Frontiers, and Summer Institute of Linguistics (SIL) announced plans to release new Arabic and Turkish translations of the Bible in which the words “Father�? and “Son�? are replaced with “Allah�? and “Messiah�? respectively, and the term “Son of God�? is translated as “Messiah of God.�? The reasoning according to the three organizations working cooperatively is that in certain cultures a wrong impression of Jesus’ relationship to the Father would be misunderstood as the two having a biological connection. The news has sparked responses from agreement to outrage among Christians. Biblical Missiology, a ministry of Horizons International, has petitioned Wycliffe and SIL to retain the proper words. The primary concern in posting this chart is for Christians to be informed that these and other materials are unworthy of distribution. While Wycliffe has promised to review current in-process translations, there are active translations out in the field that already use these terms, and they are being actively distributed and published. God can only be worshipped in spirit and in truth (John 4:24). If the biblical witness of God’s eternal nature and identity as Father, Son, and Spirit are obscured or eliminated in any way then the worship of such a “God�? is in vain because it is not according to the truth (see Matthew 28:19 for the clearest statement of God’s triune nature in the Bible). The biblical warnings against corrupting God’s Word have therefore been give to us for good reason (e.g. Proverbs 30:5-6; 2 Corinthians 2:17; 4:1-2; Revelation 22:18-19). (117) 10 Questions - Booklet by Sandy Simpson - Available here on the ACT site or on Lighthouse Trails. A series of articles reviewing, in detail, this book which is one of the books laying the basis for the "A Call To All Nations" conference. (1) A Review Of The Video "God's Fingerprints In Japan"
Cordeiro states that Kikawa is a �respected scholar� and at the end wishes them the very best as �we continue to educate people of the true origins of faith in Hawaii.� Frankly some of the worst scholarship I have ever run into apart from the Transformations films by George Otis, Jr. are the books and materials put out by Kikawa. Cordeiro is stating that they will work together to educate people of the true origins of faith in Hawaii� when Kikawa�s claims are, by in large, fraudulent. This kind of information along with a whole host of other false teachings are being passed along in Cordeiro�s churches and school as well as in the Worlc Christian Gathering on Indigenous People conferences. 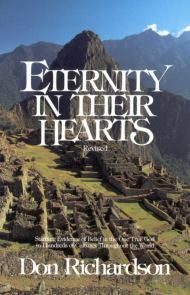 In the introduction to Mike Oppenheimer's and my book "Idolatry In Thier Hearts" I exposed the fact that Don Richardson pulled the phrase "Eternity In Thier Hearts" to use as his book title from it's context in Ecc. 3:11. He did this to support his thesis, which actually contradicts the second part of that verse, where it states that man cannot fathom what God has done. Richardson, rather, sets forth what has become the foundation for the false teachings of the WCGIP, YWAM, a number of Bible translation societies and the Emerging Church ... the propostion that all men have always been seeking God and that all Gentile cultures were already worshipping the true God before missionaries came with the Gospel. I have written this study as a further refute to the claims of people like Don Richardson, Daniel Kikawa, Danny Lehmann of YWAM and many other World Christian Gathering on Indigenous People (WCGIP) advocates. This scholarly examination by a Jewish scholar of this passage used for the title of Don Richardson's book gives the many possible interpretations of the Hebrew word "owlam" used there. As stated in my article the majority of English Bible translations actually translate the phrase as "the world in their hearts". Brian mentions that interpretation but concludes the passage should have been translated as follows: "The phrase "God has placed eternity in their hearts" from (Eccles. 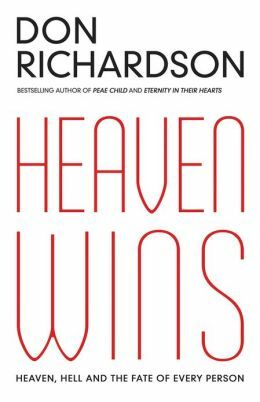 3:11) has become cliché in contemporary missiology and a repeated refrain from many Christian pulpits today.In his popular work, Eternity in Their Hearts, missiologist Don Richardson reports on stories that reveal a belief in the one true God in many cultures around the world. Based on Qoheleth�s words Richardson proposes that God has prepared the world for the gospel of Jesus Christ? In support of his thesis Richardson appeals to the words of the late scholar Gleason Archer, �Humankind has a God-given ability to grasp the concept of eternity.� While commonly accepted by scholars and laypersons alike, this notion is curiously absent from the writings of the early church fathers as well as the major theological treatise of William Carey, the founder of the modern missionary movement? ... Therefore this enigmatic phrase may best be read, "He has also placed darkness/ignorance in their hearts." If this translation is accurate, this puts it in an even more opposing light than what Richardson has tried to conclude in his book. Cultural illustrations can be helpful but only if taught in the light of the true accounts in the written Word. Putting cultural accounts on the same par as Scripture by using the mythology of pagan nations to replace what needs to be taught about Jesus Christ and the True God degrades the Bible accounts, in fact blasphemizes them. There is only one Name under heaven by which men may be saved, and there is only one Name of God, revealed by God Himself. the context of paganism and idolatry is to confuse and pervert the truth of Christ.